Gingerbread 2 Nursery is situated over 3 floors and consists of a Baby Room, Toddler Room and a Pre-School, as well as two kitchens and two gardens. Gingerbread 2 Nursery is open 49 weeks a year (closed for 1 week at Easter, Summer Holiday and Christmas) Monday to Friday 7:45-5:45, catering for children all year or term time. The Toddler Room is spread across two rooms. The main room is where the children have access to a variety of educational toys/activities/games. The room also has an interactive white board and I-Pad’s to encourage children to explore numbers, phonics and nursery rhymes. The second room is where the children have access a wide range of creative and sensory activities. This room is also used as the dining area for the children to eat their lunches. The Pre-School is located on the first Floor, comprising of three large rooms, a kitchenette and the stairs which lead to the second Floor. This is where our Rooftop Garden/Play Area is located. The larger main room is located just off from the Cloakroom and offers children access to a wide variety of activities and toys, as well as real toys which we use to help build children’s imagination and language skills. The second room is also located just off from the Cloakroom, and offers children the chance to access the Snack Bar and the Dining room during lunch time. Pre-School is also able to offer an additional service of Numeracy and Literacy Clubs that are run for children at Gingerbread 2 Nursery on a Tuesday 3:30-4:30pm. Children also have the opportunity to attend French Club, which is run by a qualified teacher at Gingerbread Cottage Playgroup on a Monday 3:15-4:15pm. Please enquire within for more information. Meal Times are an important part of a child’s development. Breakfast, morning and afternoon snacks, lunch and Tea are all provided as appropriate. All of our meals encompass fresh fruit and vegetables and are prepared by our Cook daily in the state of the art kitchen. Our Menu recognises the diverse community that surrounds the nursery and we are pleased to say we are a fully Vegetarian, Nut, Egg and Sweet Free Nursery. 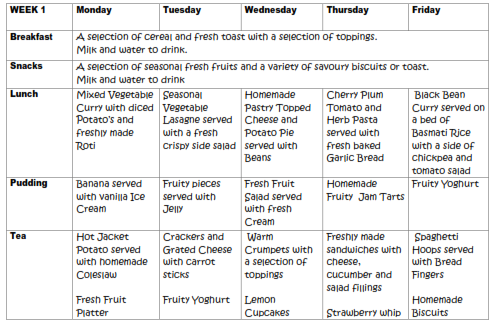 Please see an example of one of our menus.